Assumption mapping is the practice of identifying the risky assumptions being made about a new product or service. The idea is to inform better products by understanding the assumptions being made about the desirability, feasibility, and viability of a new idea. 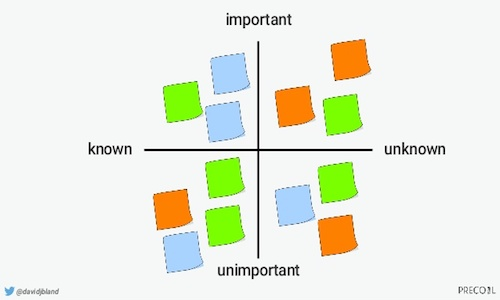 These assumptions are then plotted into four quadrants based on Known vs. Unkown and Important vs. Unimportant. Those assumptions in the top right quadrant (unknown + important) should be evaluated further using value proposition testing. The top left quadrant (known + important) should be evaluated against your current roadmap and backlog. The bottom right (unknown + unimportant) assumptions should be lead to generating more information through user interviews or other testing methods. The bottom left quadrant (known + unimportant) should be deferred.